No Doubt, Auto Show Season is the BEST time to Buy! Heiser Ford has been waiting and now the time is here: The Greater Milwaukee Auto Show starts this weekend. It truly represents the best time to buy that new Ford. Not only are you able to shop indoors and see ALL the great models Ford offers, but the factory incentives just keep getting better. Right now, you’ll get Auto Show Bonus Cash at Heiser Ford, PLUS a No-Charge 2-Year Maintenance Plan for your vehicle purchase!!! We’re still offering low 0% Financing and monthly lease payments that will knock your socks off. So, I invite you to visit Heiser Ford in Glendale soon, before Auto Show incentives expire. *Ford Credit Auto Show Bonus Cash requires Ford Credit Financing. Two-year/30,000 mile Basic Maintenance Plan with purchase. Take new retail delivery from dealer stock by 3/17/14. See Heiser for qualifications and details, including residency restrictions. Repairing an American Icon: Corvette Museum repairs and salvage could take 2-3 months It seems the whole country now knows what happened at the famous Corvette Museum. Hearts were crushed when a sinkhole opened beneath the museum's Skydome display area on February 12. 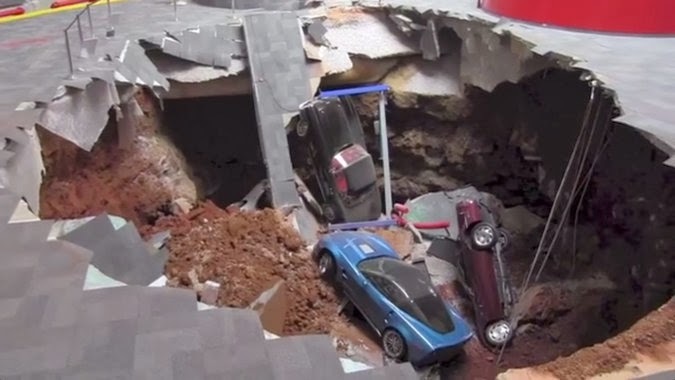 In seconds, eight classic and irreplaceable Corvettes dropped 40 feet into the ground. Twice a day, surveyors are measuring to make sure no more vehicles fall. Contractor Scott, Murphy & Daniel of Bowling Green, Kentucky set a timetable for making repairs while tourists continue to visit. The museum remains open for regular hours with the damaged area off-limits to the public. Hundreds of the latest cars, trucks, crossovers, hybrids and SUVs can be seen at Greater Milwaukee Auto Show. This year, the show runs from February 22 thru March 2 at downtown’s Wisconsin Center, 400 W. Wisconsin Ave. The annual spectacle showcases the newest trends and upcoming concept models from a variety of manufacturers. The Greater Milwaukee Auto Show offers consumers a one-stop shopping environment that is fun, interactive and non-threatening. Visitors are welcome to hop behind the wheel of the vehicles that interest them and cross-compare all in one day! In addition, dream models to aspire to will be turning heads, like the Corvette Stingray, Toyota Corolla and more. Pre-production Models – Show goers will get a glimpse into the future with a selection of 2015 pre-production models including the Chevrolet Silverado HD, Cadillac Escalade, and Ford F-150.